There’s a general principle from intro to microeconomics that says in a competitive industry, in equilibrium P=MC. So how would we actually apply that in practice to the fast food industry? At the point at which the burgers are already made and sitting on the back warmer, what’s the marginal cost to the firm of the worker picking up the burger and handing it to a customer? 5 cents? So, in an efficient fast food industry, burgers should be priced at 5 cents. Don’t you dare say that the firm needs to charge at least enough to cover average costs, because (as David points out) that involves a sunk cost fallacy… Something is obviously not right in the above. But I’m curious to see how you guys would unpack it. If you want to say, “I don’t trust them there textbooks with their funny graphs!” OK fine, but ideally I’d like you to solve it within the world of standard textbook micro, since presumably that can be done. What he's saying is that once the burger is already made, the cost of making the burger is a sunk cost, and thus the marginal cost of the burger is just the cost of the tiny labor involved in picking it up and selling it to the customer. So why is it that in the fast food industry, the price of a burger takes into account the cost of making the burger and not just the cost of handing it over to the customer? Is it because the fast food industry is far away from the conditions of perfect competition, or can this be explained using a perfect competition model? I think the thing that is perhaps causing confusion here is that, recalling that it is a true statement that "P = MC" in competitive equilibrium is not sufficient enough to understand the way in which markets function. It is imperative to recall why this is true: because so long as burger sellers maximize profit and burger eaters maximize utility, then quantity will adjust to make it true. In other words, "P = MC" is not a transcendental tautology that simply must be true under all conceivable circumstances; it is the end result of the rational actions of buyers and sellers interacting within the framework of a market mechanism. The original question only appears to be a puzzle if you attempt to abstract away from quantity, and allow yourself to imagine that it's not important how those burgers came to be sitting under the heat lamp in the first place. In the original question, there are really two distinct notions of "marginal cost." The first is that of the marginal cost to produce the burgers. The second is the somewhat different concept of the marginal cost of delivering the completed burgers to the customer (ie, taking them out from under the heat lamp and handing them to the customer). Being sloppy in our use of language, and unintentionally blurring the line between these two distinct costs is, I think, another way to describe the ultimate source of confusion in this example. Let's just be clear, using clear notation. Call "MC1" the marginal cost of producing each burger. Let's say for the purposes of illustration that each burger costs $2 to make. Call "MC2" the marginal cost of handing a completed burger to the customer. As in the example, let's assume that this is equal to 5 cents per burger. Hopefully it does not require too much convincing to establish that, in competitive equilibrium, burger sellers will end up collectively supplying exactly the amount of burgers, Q, for which it is true that the prevailing price of a hamburger is exactly equal to MC1. It's also true that, in this equilibrium, each burger seller can sell all the burgers that they have chosen to produce at a price of P = MC! = $2/burger, since the market clears. Now, at this point, each burger seller has already chosen a quantity of burgers to produce. So even though it's true that, once the burgers have been made, their production cost is a sunk cost, and from that point, the marginal cost of delivering the completed burgers to a customer is only equal to MC2 = $0.05, it will still be the case that no seller has any incentive to charge any less than P = MC1. Again, this is true because, in the competitive equilibrium characterized by P = MC1 and quantity Q, the market clears. This means that each and every seller of burgers can sell 100% of their stock of completed burgers at a price of MC1 ($2/burger). No seller has anything to gain by offering an even slightly lower price to the market, let alone offering a price as low as MC2. Perhaps it's helpful to reinforce the role of the (endogenous) equilibrium quantity Q by looking at a graph. It is certainly true that, for the quantity of burgers that the restaurant has chosen to produce (aka, for the number of burgers that are already sitting under the heat lamp), the marginal cost of delivering those already-made burgers to the customer is MC2 = 5 cents/burger. But the paragraph above does not fully characterize the full marginal cost function, whose domain extends beyond the equilibrium quantity (" Q* " below). For any burgers beyond Q*, in order to deliver an additional burger to a customer, an additional burger must be produced first. 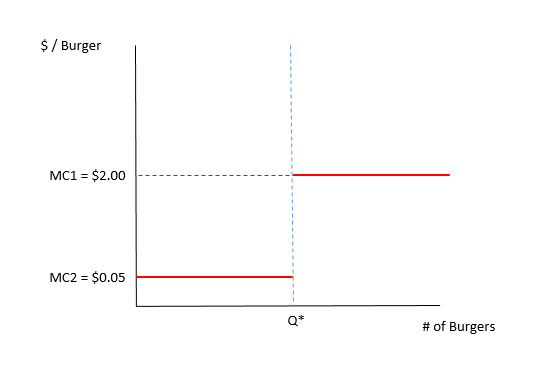 So the marginal cost of any burgers beyond Q* is NOT 5 cents per burger, its $2/burger (strictly speaking, you would have to allow that it costs USD 1.95 to cook the burger and then 5 cents to hand it to the customer). And furthermore, the location of that discontinuity is endogenous as well, since it will always coincide with the quantity chosen by a rational seller (ie, the quantity where the marginal cost of production crosses the demand curve). So even if you wish to take the position that the cost of producing the first Q* burgers is sunk, and should be ignored, it is still impossible to separate the marginal cost of production from the strategic analysis of the problem. And, of course, to finalize the characterization of the competitive equilibrium, we need to include the demand curve. As you can see, this situation reflects the strategic incentives of the burger seller, where the quantity chosen by the seller is exactly the (only possible) quantity for which P = MC and quantity demanded equals quantity supplied (ie, the market clears). 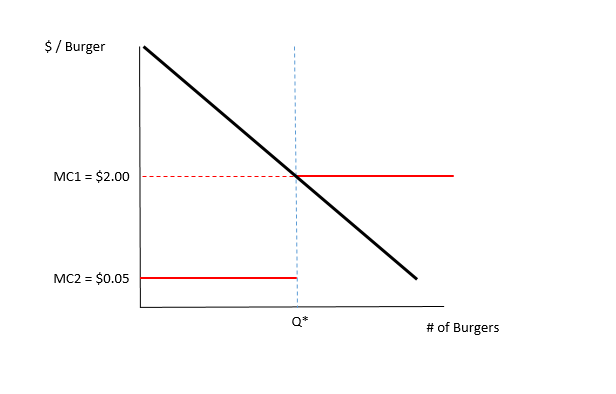 As described above, the competitive equilibrium is characterized by the intersection of the demand and MC curves, at a quantity Q*, and a price of MC1 = $2.00/burger. As above, the seller sells all Q* of their burgers at this price, and so has absolutely zero incentive to charge a lower price of MC2 = 5 cents/burger. That's sort of an odd position to take. Obviously once the burger is cooked you can't recuperate the costs, but in the aggregate, the decision to cook some number of burgers in such and such a time period is made before actually cooking them. So the cost of making a burger (including labor) isn't a sunk cost; it's a prospective cost. Additionally, just because the monetary cost of making the burger is the same for each burger doesn't make it a sunk cost, just fixed (perhaps). But more to the point, there's a time cost which varies the more burgers you cook. We pay for convenience. Part of the marginal cost of cooking the burger is the opportunity cost of that time that could be spent not running a nice little fast food restaurant. You might want to read up on repeated games. You are right, in a one-period model, once produced, the seller has little marginal cost, so could potentially sell at any price. However, his price at $t$ will affect behavior at $t+1$. He needs to credibly commit (or signal) that he will not do this again at $t+1$, otherwise he will be stuck in the same situation again. An even better example is airplanes travelling around with emty business / first class seats. They could always move someone from economy for a small fee, but prefer "losing out". Why? Because if people anticipate that they might get lucky and get a low-price first class offer, they would not pay around 7-10k for an intercontinental flight. In order to control these expectations, you better not do this at all when you can help yourself. The Murphy burger paradox is therefore a form of the Coase question of what are the limits of the firm. All firms are to some extent vertically integrated - here it is burger makers and sellers who are usually and to some extent vertically integrated. You can think of vertical integration as the firm acting as a monopolist and monopsonist over a certain set of transactions - there is only one "seller" of made burgers to the burger selling counter in McDonalds, and only one "buyer". The usual story is that transactions costs make the vertically integrated chain more efficient. But the Murphy paradox points to another sort of answer: sunk costs lead to weaknesses in negotiating games such that the sort of vertically separate structure that would produce 5c burgers cannot survive. This is the hold-up problem explored in detail by Williamson as an important part of the explanation of industrial structure. Imagine a vertically separated chain. If the sellers always exploited their "take-it-or-leave-it" power over the makers, the makers would go out of business. So in order to sustain a separated supply chain, repeated game equilibria in the bargaining need to be found. One such equilibrium is tantamount to vertical integration, which is what we usually observe. Because it`s like Coca-cola, when MC is super low or almost nothing, but you are paying a lot for the brand, which gives you emotional satisfaction. Even if you were only aware of the choice of Cola rather than say Pepsi only an unconscious level. They make you want it, and you should pay for it. Not the answer you're looking for? Browse other questions tagged microeconomics game-theory cost competition or ask your own question. What determines the outcome of a price war, and why isn't that outcome reached instantaneously? Because Sunk Costs can encode information, should Sunk Costs really be ignored? Why are inventions inevitably correlated with imperfect competition? Why is there so little automation at McDonald's?